One weekend before Halloween there was the Zombie Walk at City Hall in downtown Toronto. 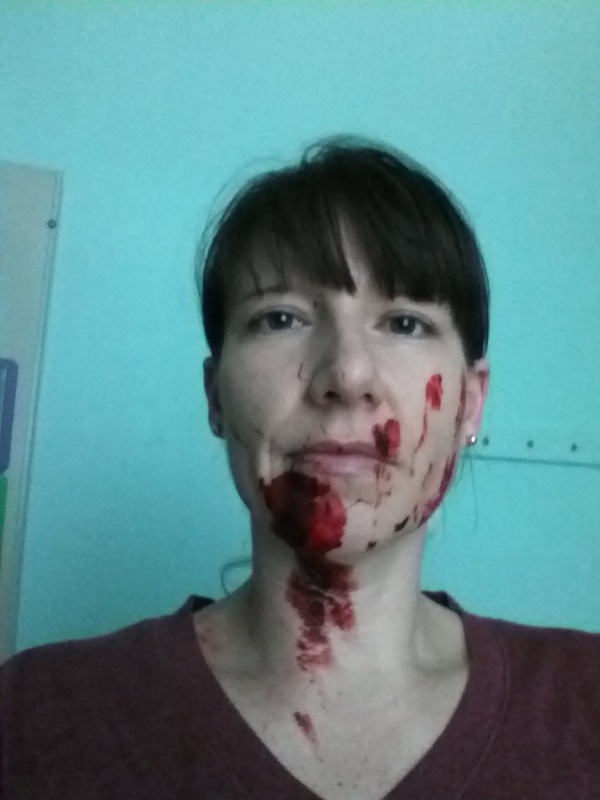 I went to Zombie-watch but was able to get free makeup so I joined the fun. It was unclear when the walk was so I did my own Zombie Walk around the block. Most people didn’t know what was going on that day so I had the element of surprise and ghoul on my side :) I had a lot of fun! I was able to scare a lot of people with my sneaky ways :-D What surprised me is when people were either so intent on their phones or talking to the person they were with or looking ahead as they walked that they Didn’t Even Notice Me. This is how I looked. Yes, some people actually paid me no mind. I sometimes waved instead of trying to eat brains, with this hand. 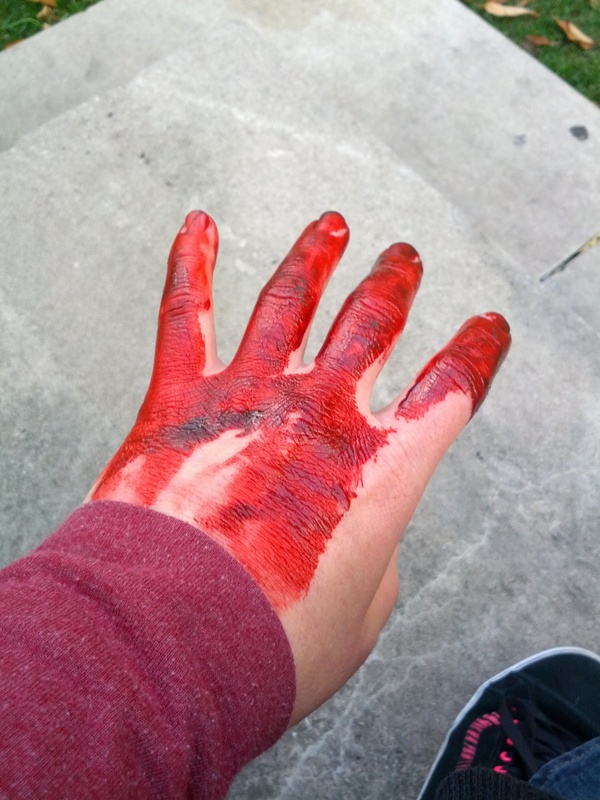 …they either smiled or waved back but didn’t seem to notice the ‘blood’ on my hand. Sometimes my hand is all they saw, or should I say didn’t see as the ‘blood’ didn’t phase them. Electronic toys are here for good, no matter the form they take. Social media will forever remain a part of our world, no matter how it evolves. But we have the choice of how much it becomes integrated into our lives. Are you able to turn off the TV, turn off the computer or tablet, put your phone down and just go for a walk or even leave the house for the day? Our idea of ‘I need it’ is like a woman’s purse. Our purses keep getting bigger yet are always full of stuff. The bigger the purse the more stuff we put in it. We don’t need most of that stuff. 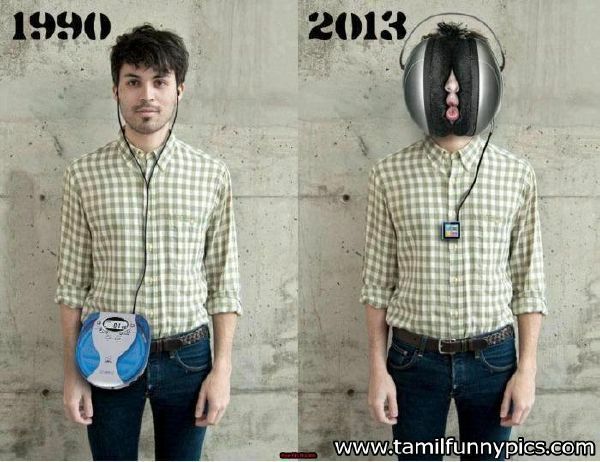 Men get by with wallets (or did before the man bag became a fashion accessory) . Our purses contain wallets as well as so much more. But we feel that we need all of that stuff. Our idea of ‘need’ is becoming skewered. Toronto is a large, multi-cultural city with a lot of people. 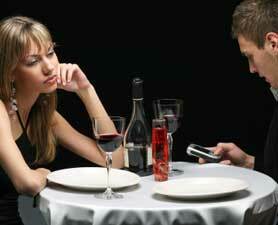 Yet many times I see people on their phones, talking or texting, ignoring all the people around them. When do we decide to be friendly with people and be open to making friends, or even just having a conversation, and other times (the majority) decide we’ll only talk or text with the people we already know. None of us came into this world having friends, we only came into this world having family (or did, if we’re lucky). We actually made friends at some point, we never just had friends. When do we decide that those people are the only friends we’ll make? When do we become resistant to adding to that friend base? The opportunity is always there but it can take things such as a new school, a new job, or a new home to force us to reach out and ‘talk to strangers’. When we talk to enough strangers we make acquaintances and friends. At the very least we improve someone’s day by being friendly. We have this feeling of separation from other humans. We see differences, real or imagined. There is so much of the Us vs Them mentality. We group people based on skin colour, religious beliefs, ethnicity, even by where they live. When we talk to someone new, even if by accident, what do we notice? We notice similarities. Shared interests, sense of humour, political beliefs, or even travel destinations. We have the same fears. We all cry. We all get hurt. 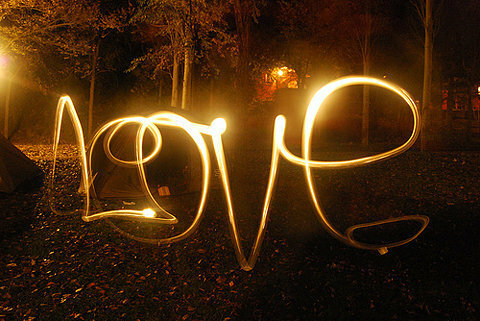 We all want to love and be loved. We all want to be accepted. We all want respect. We disconnect ourselves from each other, cut ourselves off from each other. We can be surrounded by a sea of people and will either ignore everyone and everything, listening to music and/or playing games, or texting with a few select people that we’ve allowed into our world. Once I had a conversation with someone who never took their oversized earphones off, I had no idea if the music was still playing or not. It was very distracting, it felt like if I got boring they could turn their music back on and I would never know. We all want to be loved, appreciated, respected…. 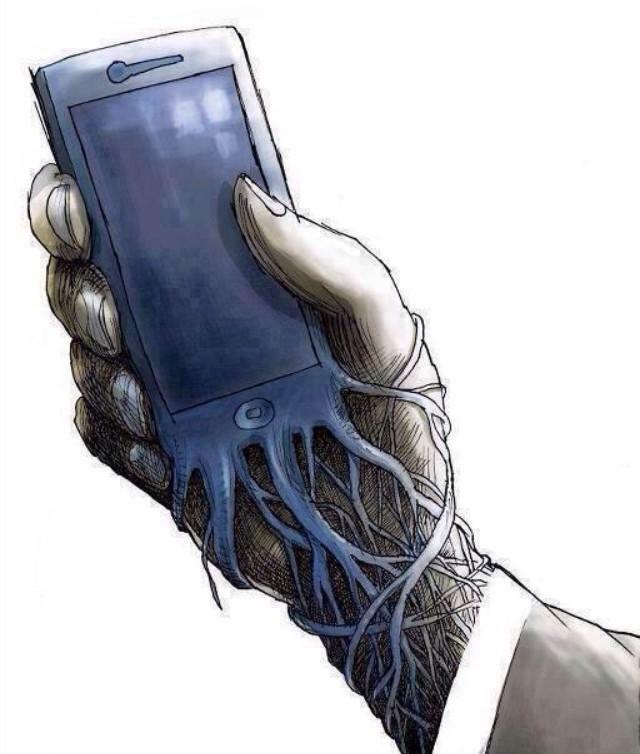 Technology is created to improve our lives and to help us connect. It’s up to each of us whether it hits the mark or not. As with just about anything on YouTube there are negative comments about this video. Those comments have to do with intolerance. And of course I LOVED this video because, to me, it represented tolerance. In the North American culture, as with anywhere, the population is exploding. So we have more people. But we also have more sensitive people. Spirituality is coming around and the more spiritual you are the more sensitive you are. The younger generations are just coming into this world more sensitive – THIS IS OUR SAVING GRACE, believe me. People are being more true to themselves, or trying to, but there are angry, opinionated people who make it hard for them. Who make things hard for all of us. Young people are TORMENTING other young people (bullying leads to suicide on a regular basis). Adults systematically discriminate against other adults all the time, or calling a spade a spade, adults bully other adults. ALL THE TIME. Our police, court systems and morgues are busy with the results of young bullies who have grown up and learned to perfect their craft. The age of intolerance, say about the last 1000 years, has to end. That is the logic of superstition, of the dark ages, of the horse and buggy, of slavery. We’re better than that. Or at least we should be. Whenever people are too loud with their opinions I file it under “He doth protest too much”. When people don’t care they are indifferent. When people are loudly letting you know something bothers them it makes me wonder why, why does it bother them so much? My first thought goes to jealousy. My second thought goes to anger; anger at the world, at themselves, at their life. Angry people will jump on the bandwagon of whatever is the ‘target of the day’: minorities, religion, women, immigrants, etc. You know, just stupid stuff. This same logic includes someone saying “those immigrants are taking our jobs” meanwhile the immigrants are working in jobs that that person had no intention of doing anyway. Their anger just needs a direction, it doesn’t have to be logical. Ok so where does that leave us? The adage ‘Hurt people hurt people’ applies here. We can’t meet intolerance with intolerance. The buck has to stop with us. I’ve been in some bad relationships (who hasn’t?) and recently I’ve decided any hurt would stop with me; when someone else hurts me I’m not going to hurt them back. The cycle of hurt, of intolerance, has to stop with us. No matter what comes our way we should only give back love, tolerance and acceptance. With time Anyone will change if treated with kindness and consideration. People are 3 dimensional, complicated beings; just because someone is angry or mean doesn’t mean they’re an ahole, it means they have issues that need to be addressed. Many ‘skinheads’ aren’t true Nazi’s, they were loners who were targeted. They were made to feel like part of a group (probably for the first time in their life), to be accepted, to be cared for. They didn’t join to collectively hate another group, they joined to improve their own life, to feel better, to feel happier. So easily that same person could have gone down another life path if another ‘group’ had paid them the same attention. The best way to combat intolerance is to be tolerant ourselves and to decide that LOVE will be the defining factor in our lives, in all that we think, say and do. Many of us love to help others. We go out of our way even for strangers; if someone needs something, and we can provide it, then we do. But the downside is that we can completely drain ourselves doing this. We can live our lives for others. This may seem very charitable but it’s not. If you don’t keep your own health and happiness in mind then you’re doing a disservice to others and to yourself. If you ‘dry’ yourself up for others, then how can you keep providing help and assistance? You can only truly help other people when your own tank is full. It’s not about just Doing, it’s about showing other people tricks and tools for how to live a great and fulfilling life. Giving your all to others can create resentment, not the outcome you want. Helping should make you feel Good! Once it stops feeling good stop and question why. I finally decided to make service to others (volunteering) a part of my life last year. But I also decided to do many other things and ended up putting way too much on my plate. It all fell apart. I’ve taken some time off from the regular demands of life – catching up on sleep, only working as much as I have to, only volunteering for 1 organization instead of 2+. I feel guilty about this at times but after spending 9 years at college/university I had to spend some time figuring out what I wanted to do with my life; none of my past programs showed me that. That is still a lot, I’ll have to figure out what I’m best at in those fields or how they can be meshed together. 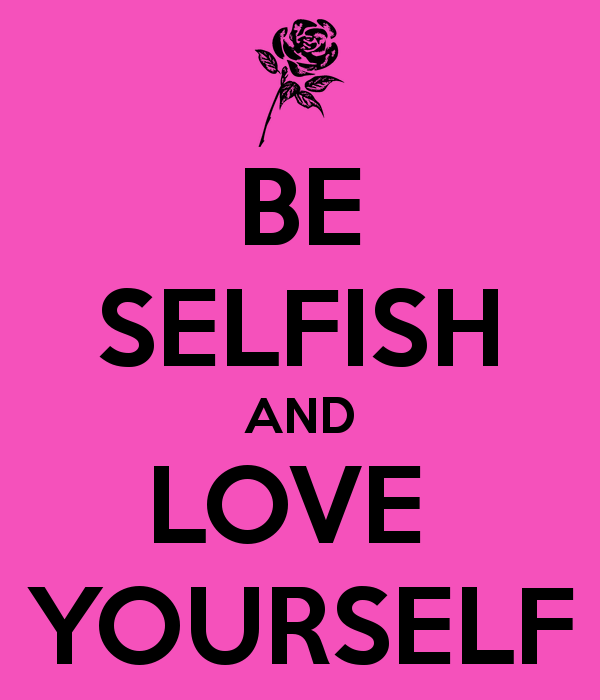 But thanks to my time of self-reflection and being ‘selfish’ (by North American standards) I have started to figure out how I can best be of service to others and myself.